Who Should Use Reflection Desktop? Attachmate's Reflection is the terminal emulation software supported by LACA for connecting to USAS/USPS. If you work in USAS/USPS frequently, you should have Reflection installed on your desktop computer (mostly Treasurers and Treasurer's Office staff). Who Should Use Reflection for the Web? Reflection for the Web provides a secure way to connect to USAS/USPS when you are at home or travelling. Please do not use Reflection for the Web if you are at your workplace and you have a working copy of Reflection installed on your computer. There are a limited number of Reflection for the Web licenses (only 10 people can be using it simultaneously). A single user can open multiple windows of Reflection for the Web, and it still only counts as one user if all of the windows are running on the same computer. Reflection for the Web has VERY specific requirements. Please read the information on this page very carefully. You MUST use Internet Explorer for your browser. Chrome, Firefox, and Edge will NOT work. You MUST have version 8 or higher of JAVA...LACA recommends updating to the latest revision that is currently available. Please note that if you are using Windows 10, the Microsoft Edge browser is the one you will most likely be running. Microsoft Internet Explorer is installed as well, but may be harder to find. 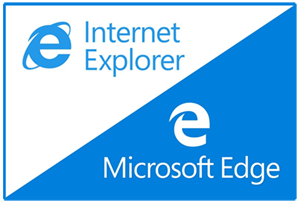 They both have VERY similar icons, too, which confuses the matter even more.Take care to insure you are running Internet Explorer, not Edge. Once the requirements above have been met, please proceed to Reflection for the Web. How to set up Reflection for use with LACA's USAS/USPS accounting system. Steps to print wide "green-bar" style reports using Reflection for the Web.